This is how the light-house is lit today. 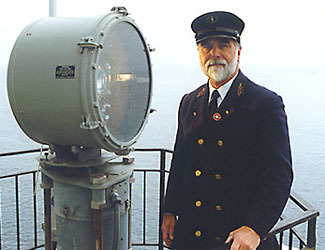 Long after my time ended here, in 1972 to be exact, the Coast Guard installed this 24-inch rotating aero-beacon to the railing outside the lantern room. With the installation of the aero-beacon, the Coast Guard kept the same signature as we had with the first-order lens, a flash every ten seconds. Within a few years, other monitoring equipment was set up to complete the automation of the Pigeon Point Light Station. Gone is the day of the light-house keepers in their blue uniforms. Now I come out to the point from time to time to remind myself what it was like and to make sure everything is running as it should. I hope you enjoyed the tour, hearing about the light-house, and how we did things back in my day. You're welcome to stay and enjoy the view. You'll have to excuse me though, I've got a lot of work to do.